There’s a tendency to think of an addict as a person who has lost complete control in all areas of their life. In fact, it is often said that addiction can’t be properly diagnosed until the patient’s substance abuse spills over into other areas of their lives, such as their career or their personal relationships. However, there exists a large group of addicts that are extremely skilled at hiding their chemical dependency. They do an exceptional job at keeping their exploits and relapses a private matter and fool even those closest to them. Many high-powered professionals wage a secret war with substance abuse until it becomes too much for them to even pretend to manage. With the immense pressure that executives face to maintain continued success in their careers, it’s inherently easy to see how substance abuse and power are directly connected. Recent research suggests that there may be additional factors when evaluating this information. A few years ago, an analysis of the brain, conducted by researchers at Johns Hopkins University revealed that some of the cerebral qualities that make a good business leader are the very same qualities that lead to addiction. the pleasure attained through success, and more specifically through risk-taking, is delivered in an identical fashion as [that from] drugs and alcohol. It has been argued for over a decade that those who are successful in business are wired somewhat differently than the rest of the population, and that their brain chemistry has led to their drive, ambition and subsequent accomplishments. The New York Times states that many successful CEOs have been found to be diagnosable psychopaths. However, these traits also have been found to be the same cerebral markers that are consistent with substance abuse. The study above mentioned that the pleasure attained through success, and more specifically through risk-taking, is delivered in an identical fashion as the rewards associated with the delivery of drugs and alcohol. Both types of pleasure arrive through the same neurological pathways. The National Institute on Drug Abuse estimates that 10 percent of the American workforce has a chemical dependency problem. In 2015, the Substance Abuse and Mental Health Services Administration (SAMHSA) revealed that 8.7 percent of full-time employees aged 18-64 engaged in heavy alcohol use in the past month. The organization also revealed that 8.6 percent used illicit drugs in the past month and that 9.5 percent were dependent on or abused alcohol or illicit drugs in the past year. Although mining, construction and hospitality were the top three industries in which substance abuse and addiction were present, professional industries also had a high concentration of addicts. Finance and insurance professionals had a past-year addiction rate of 9.4 percent; professional, scientific and technical service personnel had a rate of 8.8 percent, and public administration had a rate of 5.7 percent. Arts, entertainment and recreation scored high at 12.9 percent. 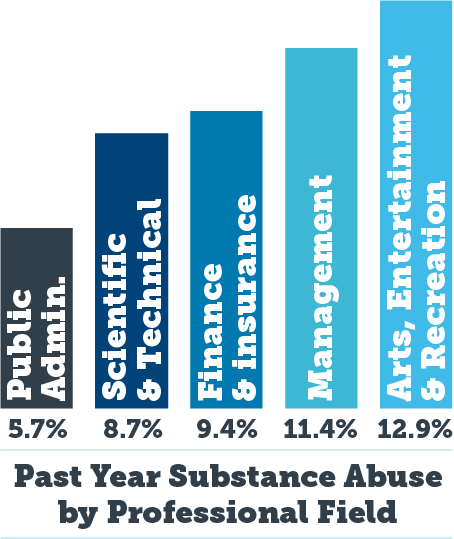 Management, an industry with a large amount of higher-level executives, had a past year substance usage rate of 11.4 percent. The breakdown of industries is quite telling and gives us an illuminating look at which professionals are more prone to letting drugs and alcohol get the better of them. One of the primary obstacles to high-powered professionals getting the treatment they need for their drug or alcohol abuse is that they surround themselves with subordinates and those who may have difficulty confronting them and addressing their addiction. The reality is that executives often have whole teams of people depending on them for their livelihood. Employees may be hesitant to address the situation and insinuate that the person who signs their checks is an alcoholic or drug addict. Research indicates that more than one-quarter of the working population is scared to be reprimanded by their supervisor. When confronted about their problem, most addicts tend to lash out and deny it. This makes many employees skeptical to do so, with the looming potential consequences of confronting the person that controls their job fate. Doctors have an extraordinary amount of influence over the lives of their patients as well as those that work for them. 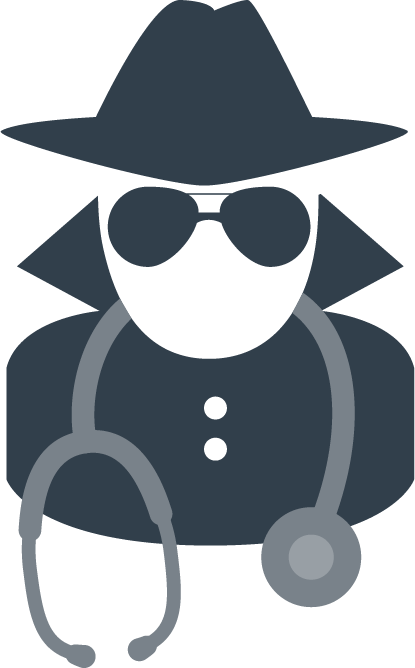 Their opinions and expertise are highly respected, and it is generally believed that they should have the final word in the dispensation of medical advice. 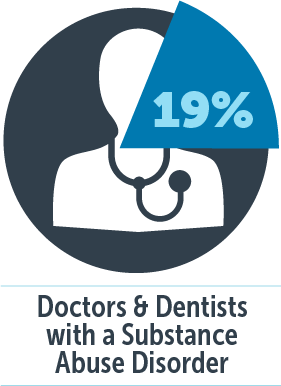 Unfortunately, the rate of substance abuse among doctors and dentists is among the highest in any professional industry. 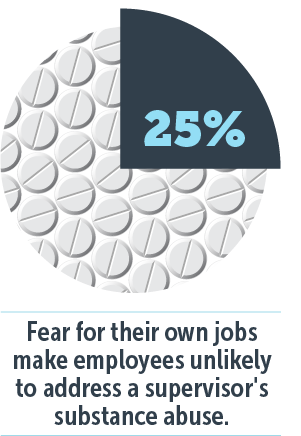 The Academy of General Dentistry estimates that as much as 19 percent of doctors and dentists suffer from a substance abuse disorder. Due to their accessibility, a majority of doctors struggling with addiction tend to abuse prescriptions. The people that spend the most time with ambitious professionals often fail to see them as human. Their success in the workplace may provide clouded judgment by their employees, many times not seeing the signs of substance abuse due to all of their accomplishments. The nature of the American workplace, whether it’s a doctor’s office, finance company, advertising agency or anything else, is that employees check their personal baggage at the door. It’s only when their problems spill over into their jobs that co-workers start to take notice. The situation may seem too complex for an employee to intervene. Success may overshadow the signs of substance abuse in the short term, but it will eventually harm the professional and their team. Although it may be difficult to address a supervisor and their possible addiction, there is nothing wrong with tactfully checking in on them to assess their mental health, particularly if they seem stressed and distracted at work. Their success and their employees go hand in hand. At Seaside Palm Beach, we understand the unique factors affecting executives in rehab. Executives and high-powered professionals require a specialized form of treatment so that they can effectively heal and successfully maintain their recovery. One of the most important parts of their treatment is that they be allowed to continue work while in the program. Seaside Palm Beach recognizes the specialized issues that high-powered addicts face and provide an executive rehab program that allows them to maintain a lifeline to their family and colleagues while in treatment. If your boss or co-worker is suffering from drug or alcohol abuse, it is time to get them help. Seaside Palm Beach can do this.